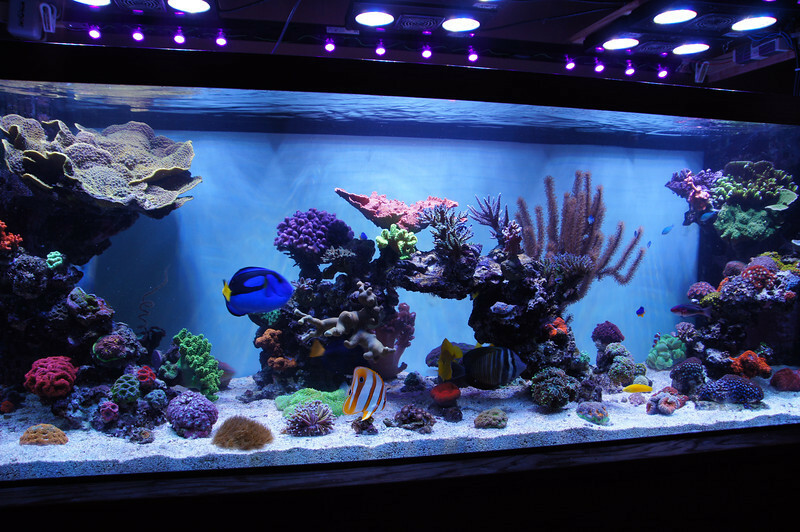 180g show ( lit by 6 Radion Gen 1 + TIR reflector upgrades & 2 DIY UV LED strips ) w/ 60g fleet farm tub that serves as both sump and frag tank ( anywhere between 150-400 frags at one time lit by 2 27" Razor LEDs ). ATS screen size is 18" X 12" lit both sides 16 hours per day via 4X24" 3000k T5 HOs with parabolic reflectors. ( I dabbled with 21 LEDs per side 17 Red/ 4 blue for a while but went back to T5s after about 6months ) Fed directly from herbie standpipe. Return pump is Panworld 100 ( approx 600-650gph after head loss ). No skimmer, quit cold turkey the day the ATS went online in Jan. 2012. 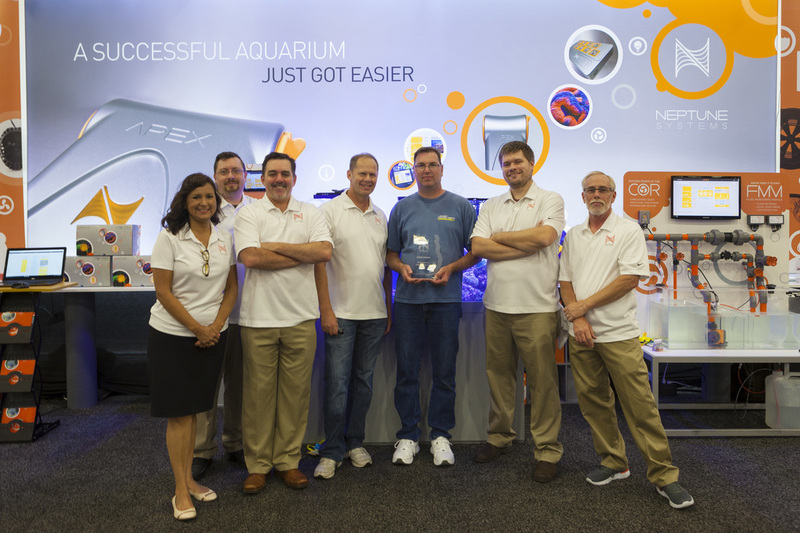 Total water change per month = 5 X 50g bags of Instant Ocean ( 1.25 boxes per month ). I have gone 2 weeks per water changes occasionally and noted no accumulation of nitrate/phosphate during the time period so I could get by with less if I wanted to but as you will see from the description the water changes fit well with my export of detritus routine so I stick with it. My tank is about as sterile looking as possible for a reef tank. Not a stich of algae in the show can't even grow much coralline algae. Every so often a might see a tiny patch of cyano in low flow areas of the sump. Phosphates .06 - .08 ppm. I strive for near 7dkh Alkalinity. 400 ppm calcium , 1280ppm Mag. Levels may drift a little higher sometimes but never lower. CA/ALK maintained by Kalkwasser via a dosing pump. Mg maintained using Randy's Magnesium Chloride & Sulphide recipe. I do add 1 cup of Randy's 2 part Ca Chloride to freshly mixed I/O. Occassionaly will add Mg to IO as well. I don't use 2 part for any daily. Water change. 1 full 50g bag of instant ocean @ 35ppt. Estimate it at 40g usuable. Siphon the entire show tank substrate during each water change. 1/2 cup of Rox .8 carbon per week in a reactor ( Helps with odor and water clarity ). I went the first 10 months without running carbon. Scrap the front glass 2-3 times a week just a very light dusting. Back glass once a week. After 1 week time the back glass is my barometer. If just a dusting enough to see the snail marks then I know I'm on target. If its darker green I know my parameters are likely off a little. Blow detritus from all rocks in show tank 2-3 times a week and always just prior to water change. Clean 1 side of ATS per week. Usually harvest about 1.75 - 2.25 cups worth of algae per week. Iron ( 2 dissolved fergon tablets in 100ml of ro water ) dose 20ml just after ATS screen cleaning. No other additives/supplements. Completely drain and clean the ATS. Completely drain sump/frag and sucking up all detritus with the shop vac. Includes an additional 40g water change to fill it back up in addition to the weekly. All frags are on racks from Rays Reef that fit in a 5g bucket. I stack 2-3 high. Loose frags are put in a 20L during the process. David your 180g looks great! Man I must have to step up the water changes. Also why do you strive for 7dkh alk and not a higher level. As many report better growth with it up a little higher. No complaints on growth. Back when I ran large skimmer and low nutrient methods anything much higher than 8dkh would cause tissue recession on acro bases. So I keep between 7-8dkh. No clue if still necessary with ATS filtration and no carbon dosing or gfo. More of a "Ain't broke don't fix it attitude at the moment". Instant Ocean generally runs about 10-11dkh so it will always drift higher right after a water change but gradually back down near 7-7.5dkh by the end of the week. That is something else dude. It is good to see such a wonderful setup maintained without all the other chemicals people say you need. I am dosing calc, kh and mag at the moment and using a good salt to replace trace elements with a 5-10% change a week. As i am growing all sps from frags, i am seeing a small amount of growth, but seeing routines like this gives a bit of reassurance. You must be very proud of the this setup! Great looking tank! I wish I had the space for something like this. I have the same size tank I just setup , your rock work is awesome ! Thanks it looks more open in full tank pictures than it does in real life ( since your usually standing with your face stuck to the glass ) but still lots more swimming room by design than your typical reef setup. I need to get a 6 months progress shot up. Tanks still looks great, some coral placement tweaking since this shot taken but for the most part it's just grown in a bit more. Since the pic was taken I have added a 60L X 24W X 12H rimless glass frag tank to the system and is now pretty much full with close to 700 frags in it. This is in addition to the 60g sump that also used as frag tank that can also hold up to 400. Mostly common stuff the I either sell for store credit or sale real cheap ( but make up for it in quantity ) at our local frag swaps. All of which are clippings from my show tank or pieces that I no longer have room for in display but keep to frag. None of it is corals that are simply purchased and just chopped up, everything is grown out in my system. With the larger frag tank and fish growing creating more bioload, I've had some phosphate levels creap up. For the first 14 months or so about the max reading would be .06-.08 but now it reaches .2ppm if left unchecked. I did some tweeking ( just 2 weeks ago so to early to tell if its working ) by enlarging the ATS screen from 18" Long to the full 24" long ( the enclosure was built with this possibility in mind ), increased the flow to accomidate the larger screen ( I went with a larger external pump that also doubles as flow for the frag tank ). I use 24" T5s so didn't have to increase light for extra coverage since was already using them. Hopefully it will increase harvests but for now do have to run some GFO as a supplement. Couple of other things I'm going to try as well before tearing down the ATS and building a larger one. For example: may swap the T5 ballast with an icecap/coralvue to increase light, also toying with the idea of adding the ceramic biomedia to my overflow that feeds the ATS to try to increase nitrate to directly feed the ATS ( not sure if that will do much but cheap and easy to try ). Even with the show tank and all the frags, I still have no trouble with using kalkwasser for all my CA/Alk supplement needs. No two part or CA reactor used. Just kalkwasser and sometimes even still alk levels get a little too high and have to back off. Please could you post a pic or two of your Filter system. 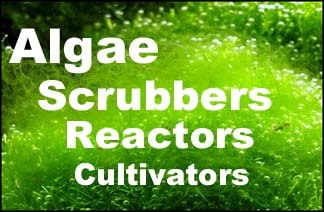 specifically your Algae scrubber.